Mexico is one of those countries that is super high on my “must-visit” list. 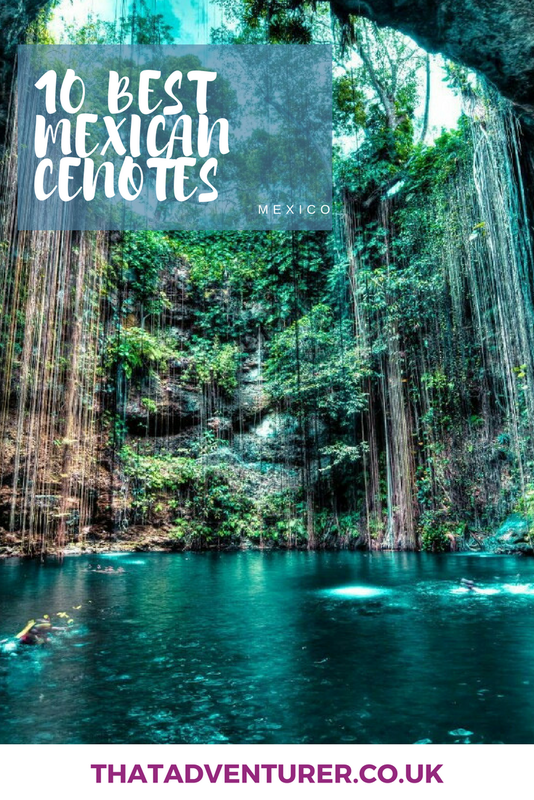 I want to eat ALL the Mexican food, explore the ruins, discover the Mexican beaches go scuba diving in Mexico and, of course, take a dip and a snorkel in the best cenotes in Mexico. Should I visit alone or with a tour? What should pack for a cenote? Cenotes are natural swimming holes. They’re formed by the collapse of porous limestone bedrock. When the rock falls it reveals a secret subterranean world of groundwater pools! 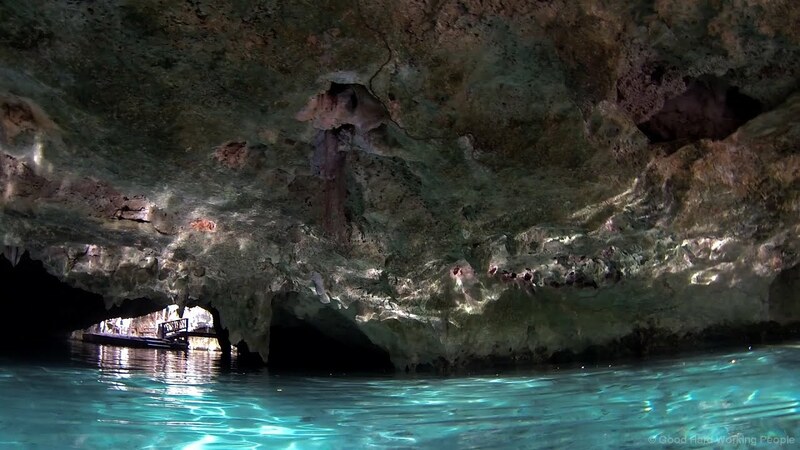 Most cave cenotes have fresh water that has been filtered by the earth. This makes the water super clear and pure. So clear in fact that you can often see straight through to small fish darting about in the plants. Travelling to Mexico? 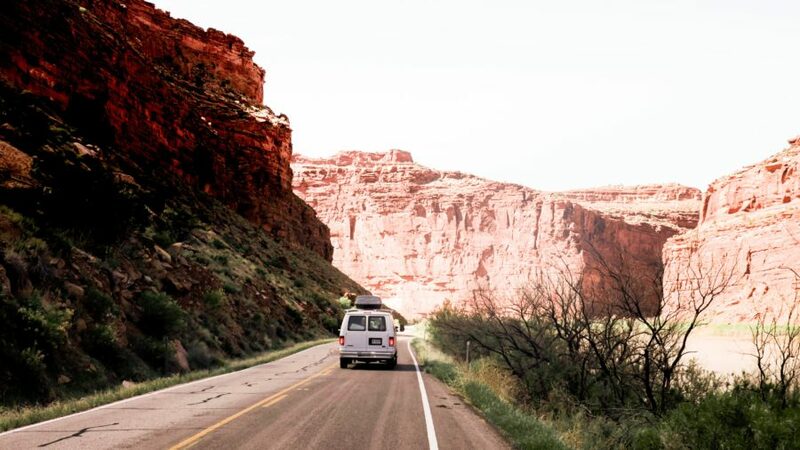 Get your travel guide here. The Ancient Mayans worshipped cenotes because they were a water source in dry times; the name cenote means ‘sacred well’. They settled villages around cenotes and believed that they were a portal to speak with the gods. When you visit a cenote today it’s easy to see why they held the Mayans in awe. Swimming in the pristine waters feels like stepping back in time thanks to the giant tropical trees and vines and the almost-eery sunbeams. Whilst you can easily visit these beautiful Mexico cenotes alone you may also want to combine a cenote swim with a tour to other parts of Mexico. These day tours and excursions in Mexico are great if you’re a solo traveller and want to meet new people! Bring swimwear, sunscreen, water, sandals/flip-flops and a towel, and leave valuables at home. Entrance fees are usually around 100 pesos (USD$8/£5; cash only) per person. Due to their popularity, a lot of cenotes have changing facilities, plus flashlights, life vests and snorkelling equipment for hire. And in Mexico, there are always taxis and snacks nearby. Use this map to find your way around the best cenotes in Mexico. This map includes some of the best cenotes near Tulum and the best cenotes in Yucatan. The name Dos Ojos means ‘two eyes’ and describes this cenote’s two pools of water: one blue and clear, the other dark and cavernous. Both pools are nice to swim in, but the darker of the two gets the most attention for its light-free snorkelling. You can rent diving gear at the cenote itself and don’t forget to get a torch so that you can see the stalactites up above. Swimming at this Mexico cenote can be a bit cramped and claustrophobic, but it’s exhilarating to see beams of light cut through the clear waters below. At Cenote Dos Ojos you can also walk through dry caves and see bats snuggling among the stalactites. Gran Cenote is just like a remote tropical beach in an underground cave! Wander down the path to the white, sandy shoreline at the bottom before descending through gardens of tropical foliage. Snorkelling is the main attraction here and swimmers come face to face with a rare triad — fish, turtles, and stalagmites. Cenote Azul has the charm of an old theme park. It’s not one of the biggest cenotes in Mexico, it’s smaller and a bit quieter. But that’s what makes it one of the top cenotes in Mexico! The clear turquoise water is full of tropical fish and the pool is just waiting to be discovered by eager snorkelers and divers! There’s also a mini cliff which you can jump off, smaller pools to wade through and a path to stroll along to get a view from all angles. Cenote Samulá is in the town of Dzitnup. This is one of the best cenotes in Mexico and possibly one of the best cenotes in the world. It’s a photogenic celebrity. There are even coloured artificial lights that gently pulsate through the enclosed cave! Make sure to look up where you’ll see long tree roots crawling through the hole up above. The tree stays alive because its roots drink the cenote’s water! Jump in and swim with the catfish who’ll nip at your feet and watch the bats up above. You don’t have to miss out on seeing the Mayan underground wonderland because you hate tight spaces or don’t fancy swimming. Grutas (caves) showcase cenote views without you having to get wet. The Grutas de Loltún are the largest caves in the Yucatán Peninsula and offer a spectacular path through Mexico’s inner world of monumental ceilings. Follow a guide who’ll lead you through a network of caverns decked out in hand drawings thousands of years old. Spot tree roots bursting through the ceiling. Gaze at the stalagmites and stalactites that have joined to form columns and have a go at thumping them to make the rocks ‘sing’ the caves’ name, ‘Lol’ and ‘Tun’. Ik Kil is en route to the Chichen Itza ruins which makes it one of the busier Mexican cenotes. That doesn’t necessarily mean you should give it a miss though! The 60ft pool comes with a restaurant, gift shop and a well-lit limestone staircase that’ll take swimmers to the hanging vines and blue waters below. If you’re feeling even more adventurous then try some extreme diving (but use caution!). This diving is so extreme that Red Bull held a dive competition here a few years back! 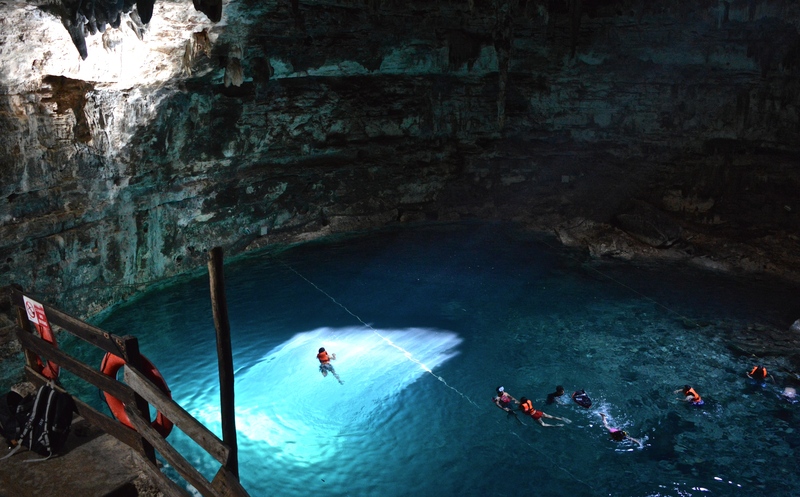 Zaci is the only in-town cenote in Mexico. In the small Mexican city of Valladolid, you can hike into the 260ft cave and enjoy a shady respite. You may even see a few workers who’ve left their desk at lunch taking a swim! Perhaps don’t jump straight in though; you’re right next to a bunch of city sewer line! The Suytun cenote sits on a private ranch outside Valladolid and boasts some of the clearest water of any watering hole in Mexico. You can gaze to the bottom of it from the observation platform! Although gaze is all you’re gonna want to do as the water is freezing! Make time for the daily performance of Mayan dance too! There are three cenotes to choose from in Cuzama, each offering visitors a different experience. First try the “tree-root-dropping-into-a-cavern” cenote. To get there walk down the old wooden staircase at Chacsinicche and watch the light bounce off the water and dangling roots. If it’s vibrant, blue-green waters you’re after then check out Bolonchoojol, a dark cavern lined with stalactites. Since the only light that comes into this popular cenote is from the small hole in the roof, the best time to visit is the middle of the day. At this time the light beams straight down into the pool and gives an almost heavenly-spotlight to the waters below. Unfortunately, there’ll be a ton of other people there to bask in the light with you as it’s crazy popular – but for good reason! If you want to make it an afternoon, swimming is allowed (they’ve got a lifeguard!) and you can even lounge on the small island in the middle. These cenote spots look pretty fantastic and I didn’t know much about them before reading this. I think I’ve seen a picture of Ik Kil before maybe on Instagram. Also you mention to leave valuables at home. What is the best way to take photographs? By bringing a waterproof case for it?